Jan ten Compe (Kompe), Dutch painter, draughtsman and dealer. In 1736 he became a citizen of Amsterdam, where he spent most of his life, apart from 1740 to 1755, when he lived mostly in The Hague. He was a pupil of the decorative wallpaper and landscape painter Dirk Dalens III (1688-1753). 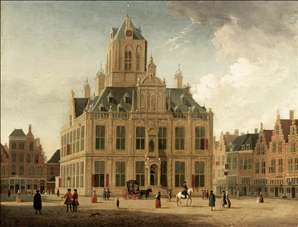 Ten Compe produced mostly views of country houses and townscapes, including Haarlem, The Hague, Amsterdam, Oudekerk aan de Amstel, Delft, Leiden, Rotterdam, Utrecht and Kleef. One of the best topographical artists of his generation, he worked in a detailed, controlled and elegant manner, influenced by such 17th-century townscape painters as Jan van der Heyden and the Berckheyde brothers, several of whose paintings he copied. 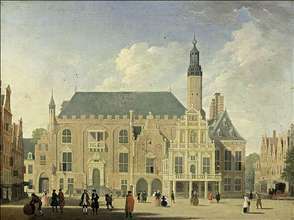 Like the Berckheydes, he painted mostly topographically accurate views, as in the Amsterdam Stadhuis with the Nieuwe Kerk (1744; Amsterdam, Historisches Museum), with its impressive town hall building dominating the scene. For some of the views, preparatory drawings survive, some of which had watercolour washes added by Jacobus Buijs (1724-1801). Ten Compe s drawings were engraved by Pierre Charles Nicolas Dufour (1725-1818) and Robert Muijs (1742-1825). Ten Compe worked for the collectors Frans van de Velde, Gerrit Braamcamp and Jan van Rijneveld. His works were very popular, one painting sometimes fetching as much as 2000 florins. He had one pupil, Gerrit Toorenburgh (1732-85), who himself became a town- and landscape painter. See more details about "Haarlem: View of the Town Hall"
See more details about "Delft: A View of the Town Hall Seen from the Grote Markt"